[exopolitics] From Dr. Michael Salla: Growing Media Interest in UFOs - Is Partial Official Disclosure of UFOs as Classified Antigravity Vehicles Inevitable? The Space Preservation Treaty bans all space-based weapons, and establishes an independent Outer Space Peacekeeping Agency to monitor outer space and enforce the ban. The public opinion poll reported January 24, 2008 (See below) showing that large majorities of Americans and Russians oppose all space weapons in effect supports a public position against a weaponization - or attempted weaponization - by the U.S. military-industrial complex against ethical upper dimensional Extraterrestrial civilizations now visiting Earth. Most Americans and Russians agree that their governments should work together to prevent an arms race in space. Large majorities in both countries favor unilateral restraint and a treaty that would keep space free of weapons. Americans and Russians also support treaties that would prohibit countries from attacking or interfering with each others’ satellites and from testing or deploying weapons designed to attack satellites. These are among the key findings of a WorldPublicOpinion.org poll of 1,247 Americans and 1,601 Russians developed in conjunction with the Center for International and Security Studies at the University of Maryland (CISSM). Knowledge Networks in the United States and the Levada Center in Russia conducted the interviews. Majorities in both the United States (78%) and Russia (67%) say that as long as no other country puts weapons into space, their own governments should also refrain from doing so. Most Russians (72%) and Americans (80%) also favor a new treaty banning all weapons in space. Support for such a ban was strong among Americans even when they were presented counter arguments about the potential military advantages of deploying such systems. The US poll revealed strong bipartisan consensus on the issue. Majorities in both the Republican and Democratic parties believe the US government should refrain unilaterally from deploying space weapons. There is also bipartisan backing for a treaty to ban these weapons, though support is higher among Democrats. Steven Kull, director of WorldPublicOpinion.org, noted that there was remarkable agreement within and between the two countries on the issue of space weapons. “What is striking is the robust consensus—among Russians as well as Americans, and among Republicans as well as Democrats—that space should not be an arena for the major powers to compete for military advantage,” Kull said. “The use of space for common protection is, in fact, far more important for all countries under the circumstances of globalization than the pursuit of national advantage in performing traditional military missions,” Steinbruner said. Does this photograph really prove that we are not alone in the universe? Images beamed back from Mars would suggest so - although to sceptics, it could just be a strange rock formation. Nasa's Mars Explorer Spirit sent back images from the surface of the Red Planet four years ago, and there was initial disappointment among scientists that they lacked any signs of life. But space and science fiction enthusiasts are convinced there is more than meets the eye, and after years of studying the images, have found what appears to be an alien figure walking downhill. The discovery of the life-like figure ambling across the surface of the planet is likely to further boost intrigue in our nearest neighbouring planet. An earlier rock formation, dubbed "the face of Mars" showed what appeared to be a human head staring into the night sky. The pictures, found on a Chinese website, are now creating a stir of excitement on the internet. One keen stargazer said: "These pictures are amazing. I couldn't believe my eyes when I looked and saw what appears to be a naked alien running around on Mars." Nasa's Mars Explorer Spirit is now starting its fourth year of exploration. Rovers are deployed because it has so far been too costly and difficult to achieve a manned mission to Mars, and because probes and satellites are too limited to explore the Martian surface. The Spirit rover was launched on June 10, 2003. Aloha, here's another story on a photograph taken by one of the Mar's Rovers showing a mysterious figure in the Martian landscape. 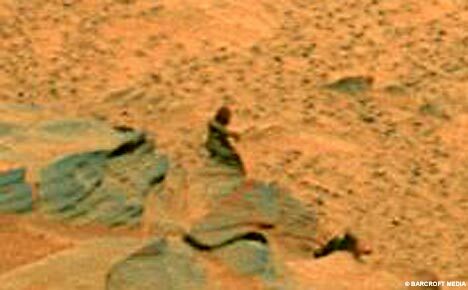 A number of news sites are running stories on the anomaly which looks very much like a Sasquatch running down a Martian hill. NASA scientists are trying to determine what it is. Even if no official announcement comes confirming life on Mars, it does look as though the public is being prepared for the reality of extraterrestrial life through the release of such photos. It should be pointed out that the Times Online has been running many stories leaking information on a range of political issues such covert plans to attack Iran, etc. It does look as though the Times Online is being used by progressive elites to leak information to inform the public so let's hope this photograph gets more mainstream media attention. We may be very well in the midst of an accelerated disclosure program. Does this photograph prove there is life on Mars? Is it a rock? A trick of Martian light on the eye? Or Osama Bin Laden waving from his barren hideout 300 million miles from planet earth? NASA scientists have been puzzled by the peculiarly life-like image which has been beamed back to earth by one of their two robot rovers that are currently trundling about the surface of the red planet, on the hunt for clues of life on Mars. It will delight spacewatchers who have been so far disappointed by the lack of images of little green men captured by the twin vehicles on their four year mission. The alien figure was pictured at the far left of one of the panoramic photographs taken by the exploration rover, Spirit, from the top of a low plateau in late 2007. The robot vehicle and its twin, Opportunity, have been roving around on Mars since completing their first successful mission in April 2004. Their principle goal is to hunt for geological evidence of water, that suggest an environment which may once have been hospitable to life. Having been launched from Cape Canaveral, in Florida, in June and July in 2003, they travelled 487 million and 456 million km respectively to opposite ends of the planet, where they went on to explore the dusty, rock-strewn landscape. Each solar-powered rover is a sort of the mechanical equivalent of a geologist walking the surface of Mars. The mast-mounted cameras are mounted 1.5 meters(5 feet) high and provide 360-degree, stereoscopic, humanlike views of the terrain. The robotic arm is capable of movement in much the same way as a human arm with an elbow and wrist, and can place instruments directly up against rock and soil targets of interest. In the mechanical "fist" of the arm is a microscopic camera that serves the same purpose as a geologist's handheld magnifying lens. The budget for the project is around $820million. Last week, a similar probe captured the first images from the "dark side" of Mercury, which showed previously unseen hemisphere from 17,000 miles. In this farming community where nightfall usually brings clear, starry skies, residents are abuzz over reported sightings of what many believe is a UFO. It was New Year's Eve, after all, and people may be in altered states where they see lots of strange things. But three groups of San Diegans swear they were sober enough to report seeing strange orange-yellow lights in the sky about 30 minutes after midnight. And the National UFO Reporting Center said Tuesday it got enough "similar reports from across the country" to warrant a follow-up investigation. Ryan Keegan and his wife, Rachael, were leaving a friend's party at their apartment complex in Bay Park about 12:30 a.m. when they saw the unidentified objects. They went in and got their friends and took pictures with a cell-phone camera. "We saw four orange lights in a square and right behind there were three orange lights in a triangle," said Keegan, who is in the home-financing business and whose wife is a kindergarten teacher. "There was no sound, no flashing lights, no vapor trail, just solid lights." They continued to watch the sky and Keegan said the group saw four more lights appear about 12:45 a.m. The lights traveled east to west, then disappeared in the sky over La Jolla. Keegan said he and his friends had been drinking, "but we weren't drunk being that it was Near Year's." About the time same in Pacific Beach, Dustin Gannon, an amateur astronomer, said he and about a dozen friends saw the lights from the backyard of his home. Gannon described them as nine red dots that traveled across the sky for about seven minutes. About a half-hour later, the group saw four red dots. They captured the images on video. "We're still a little freaked out," he said. "It was really crazy. It wasn't fireworks." Reached at the National UFO Reporting Center in Harrington, Wash., about 50 miles west of Spokane, center director Peter B. Davenport said a woman he knows in the UFO field made a similar report. She and five people saw the lights traveling in formation heading west toward Del Mar. She described it as one single unit with seven lights in total followed by an orange triangle formation; both disappeared into the marine layer over the ocean. "Based on the fact that I actually know the witness who submitted this report, and based on the other seemingly similar reports from across the country last night, I would categorize this sighting over San Diego as of interest to us," Davenport said. San Diego police said Tuesday they did not receive any calls about New Year's Eve UFO sightings. The National UFO Reporting Center also received reports of similar sightings in Santa Monica, the San Francisco Bay area and Canada. Ken Stone of SignOnSanDiego contributed to this report.